Vampires. They are the most elegant of monsters--ancient, seductive, doomed, deadly. They lurk in the shadows, at your window, in your dreams. They are beautiful as anything you've ever seen, but their flesh is cold as the grave, and their lips taste of blood. From Dracula to Twilight; from Buffy the Vampire Slayer to True Blood, many have fallen under their spell. Now acclaimed editor John Joseph Adams brings you 33 of the most haunting vampire stories of the past three decades, from some of today's most renowned authors of fantasy, science fiction, and horror. Charming gentlemen with the manners of a prior age. Savage killing machines who surge screaming from hidden vaults. Cute little girls frozen forever in slender bodies. Long-buried loved ones who scratch at the door, begging to be let in. Nowhere is safe, not mist-shrouded Transylvania or the Italian Riviera or even a sleepy town in Maine. This is a hidden world, an eternal world, where nothing is forbidden... as long as you're willing to pay the price. 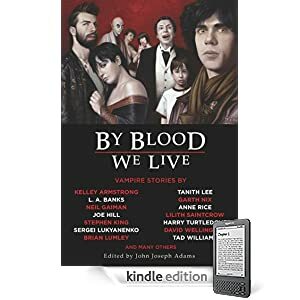 To read free stories, author interviews, news, and more, visit the official By Blood We Live Website! Or purchase By Blood We Live as a DRM-free e-book in the format of your choice through WebScription.net.